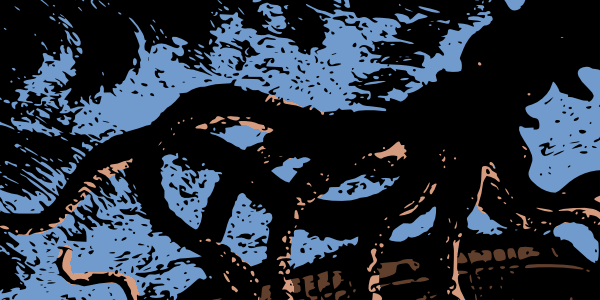 The details of programming tentacle movements for aerial monsters, with interactive examples. Note: If you read this post on my website, there are interactive examples. With Airships dev 8 complete, it’s time to start creating monsters. Monsters and pirates is what dev 9 is going to be all about. What sets monsters apart from normal airships is that they can have abilities that are a little more out there, that would be hard to give to players for reasons of balance or user interface. One of these things is tentacles. Giant aerial kraken will descend from the skies and begin snacking on your crew as you attempt to fend them off. Now, Airships’ graphics may not be the fanciest, but they do pay attention to detail. A fixed tentacle graphic swinging by would be boring: how about properly animated ones? I wanted to try, at least. 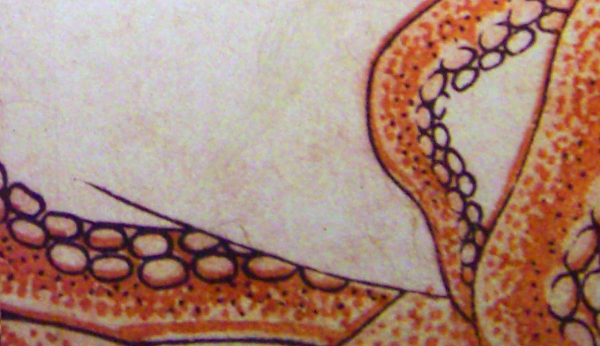 A tentacle consists of about 20 segments. Each segment is attached to the previous one with a joint. There are two muscles in each segment, which can independently shorten, up to about half of their original relaxed length. The angle of a segment is determined by the angle of the previous segment plus the angle created by the differing lengths of the muscles. This model has two advantages: it’s close to how actual tentacles work, and the behaviour of the tentacle comes down to the behaviour of each muscle, which can be represented as a single compression value. I programmed this model and started out with a simple rule that made the muscles relax by default, straightening the tentacle and extending it to its maximum length. Then, to test it, I turned the cursor into a kind of an “electroshock” tool which would contract nearby muscles with a mouse click. This let me check that I’d wired up the model correctly, and that the basic movement of the tentacle was fluid. There would be an interactive sample here. Go to the version of this post on my site to see it. My basic idea for muscle behaviour was as follows: each segment should attempt to position itself to be at a certain angle relative to the target point. Segments at the start of the tentacle should point straight towards the target, while segments towards the end should aim to be at an increasing angle towards it, still coming closer, but encircling it. Each muscle would figure out in which direction its segment needed to rotate and expand or contract accordingly. And this already worked pretty well! The tentacle would head towards the target and then curl around it. The main problem was that it would not actually touch it. For the next iteration, I modified the behaviour so that the tip of the tentacle would again want to point straight towards the target. I also adjusted the compressibility of the segments, making the segments at the base stiffer and the ones near the tip more flexible. Once that was in place, the tentacle was able to get within a fairly short distance of most target points. In-game, the tentacles of the sky squid will seize individual crew members and deliver them to the maw of the creature. I programmed this in next, giving the tentacle targets that alternated between random points and a fixed point next to the tentacle’s base where the mouth would be. 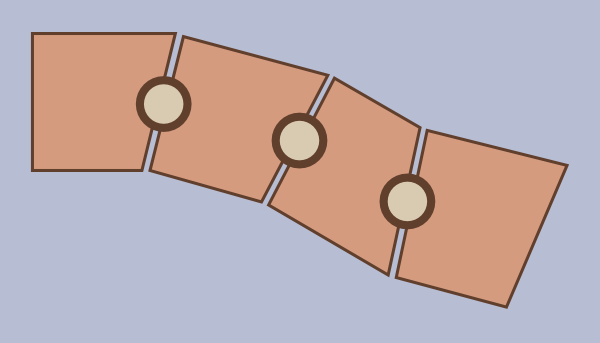 There were still some cases where the tentacle would get stuck, each segment having locally optimized its position but the tentacle as a whole failing to connect, vibrating as it tried to optimize further. Effectively, the tentacle was stuck in a local maximum. No small change would improve its position. So I put in an extra rule that if the tentacle took more than about two seconds to find its target, it would temporarily relax the muscles in its base, causing a large movement that would get it unstuck. The tentacle’s behaviour is now reliable and looks cool, and is ready to be integrated into the game.